Our Prague City Bike Tour is an easy-paced cycle ride around the centre of Prague, to discover the sights and attractions in the way only a bike makes possible. Young and old, new bike riders to advanced cyclists, will all cope with and enjoy this trip; there are no real hills involved. The Prague Bike Tour lasts 2½ hours and covers the main areas of the city: Old Town, Wenceslas Square, Charles Bridge, Jewish Quarter and the Lesser Town. Famous sights we see en route include: Municipal House, Rudolfinum, Estates Theatre, National Theatre, Astronomical Clock, Powder Tower, Dancing House and many more. 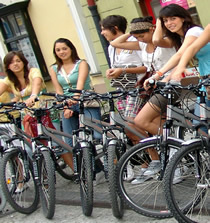 Our Prague bike tours offer visitors a unique historical experience, in a fun and entertaining manner. As we ride thorough the streets, the famous squares, the parks and along the river banks, immerse yourself in the stunning architecture all around. Note: We also offer a bike tour which covers both the city centre and the elevated areas surrounding Prague: Prague City & Castle Bike Tour.